-It seems that there was a test screening of “The Death and Life of John F. Donovan” on Wednesday in USA, and some first reactions have appeared on Letterboxd. It’s likely that we can finally see the film by Xavier Dolan in the coming months (Cannes maybe?). We can finally see the look of Natalie in Vox Lux, the new film by Brady Corbet. These are the first pictures of her on the set…. and wow, what a haircut! We have another behind-the-scenes throwback photo for you all tonight, this time of Natalie having her makeup done on the set of Star Wars: Episode II – Attack of the Clones. We’ve updated the gallery with a new-old photo of Natalie on the set of Black Swan (the gift that keeps on giving). Finally here we have the first pictures of Natalie on the set of Annihilation. They don’t have a great quality, but we can see the look that she will have in the movie. It’s a very quiet beginning of week in Natland, but here are a few tidbits for you all, guys. 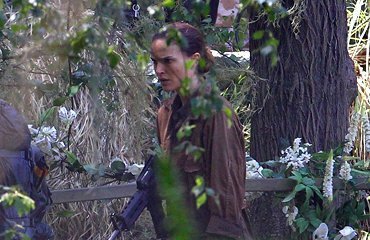 The filming of “Annihilation” continues, and gradually get to know more details of the movie. Residents and businesses living near Alison’s Road have received a letter from the supervising location manager for the movie, Alex Gladstone, telling them of plans for filming between Friday (May 27) at 6pm and 5am Saturday morning. The letter says: “Alison’s Road, Aldershot, has been identified as a great visual and logistical potential in being used to represent a ‘Baltimore Street’ in the film. We’ve updated the gallery with 9 HQ photos of Natalie filming a funeral scene for Jackie in downtown Washington, D.C. last month. Thanks to anna1992anna. We have quite a few more Natalie sightings from Jackie filming in downtown Washington, D.C. earlier today. Five more are after the jump. Check out this great new Knight of Cups production still by Melissa Sue Gordon over at Terrence Malick community One Big Soul. Thanks to Belerofonte for the find. Makeup artist Saraï Fiszel shared this great new Instagram snap of Natalie on the set of her upcoming film Planetarium in Paris. Thanks to Belerofonte for the find. Instagram user Frank Sotomayor posted a photo of Natalie and himself on the set of Jane Got A Gun. Thanks to Belerofonte for the find. Natalie was snapped filming Plantarium in Paris again, this time on Tuesday. Hit the thumb below to check out the gallery. Thanks to Belerofonte and Iktriad. Yesterday, we got some lovely shots from the Planetarium set in Paris, which can be found here. Luckily, user Aurore actually got a first hand experience on this new shoot. Here is a look at what went down. Congratulations on the awesome experience! We’ve updated the gallery with a new/old Star Wars: Attack of the Clones set photo of Natalie filming in front of the blue screen.